It can take you by surprise if you child comes to you and informs you that he/she have decided to become vegetarian. This can be shocking to a parent and very overwhelming. For families who eat a lot of meat this can be very challenging as well. Learning how to work through this dietary choice as a family is important. I have experienced this first hand in my own family and then also worked to counsel families who are going through this experience. My younger sister decided to become vegetarian when she was in college. She made the choice to stop eating meat and if I remember correctly this happened in the summer immediately prior to a family vacation. It was challenging for my family, because my sister was also restricting her overall caloric intake and then struggling with disordered eating. My sister has continued to be vegetarian for several years, but has thankfully overcome disordered eating and still practices vegetarianism in a healthier way now. This was obviously challenging for family to navigate my sister’s dietary preferences with the rest of the family. It is important to help remind the parents that their child is making a choice about their diet isn’t a personal reflection of them, but instead an expression of their child’s independence. Talking through why their child is choosing to avoid meat, where is the desire coming from and what prompted that change? How does it make the child feel? How can the parent work to support their child’s independence in a healthy way? If you child is choosing to be vegetarian that is great, but they need to be choosing healthy foods. Being vegetarian doesn’t mean they should be eating crackers all day with PB&J sandwiches for every meal. Being a healthy vegetarian means that they are consuming more fruits and vegetables and finding ways to increase their consumption of plant based proteins (beans, soy, hemp, etc). Also making their that the child’s choice to be vegetarian isn’t an excuse to calorie restrict. Sometimes disordered eating is masked by a dietary preference like avoiding meat, or cutting out a particular food group. That is unhealthy and not safe for a growing child. Working with a Registered Dietitian to help facilitate these discussions can be helpful. It is tough sometimes for a parent and child to have an open and productive discussion without a 3rd party to help mediate. It is easy for emotions to get in the way and then creative a stressful/hostile environment. Discuss this dietary change and what all surrounded this shift in eating. Having this open communication is key to embracing and working through this new behavior in a positive way. This can be where having another person, like a Registered Dietitian, can be helpful to lead this discussion and help both parties (child and the parent) share their feelings in a non-judgmental environment. Talk about what this means in terms of the family dynamics at meal time and in regards to food preparation. This is one of the biggest challenges. 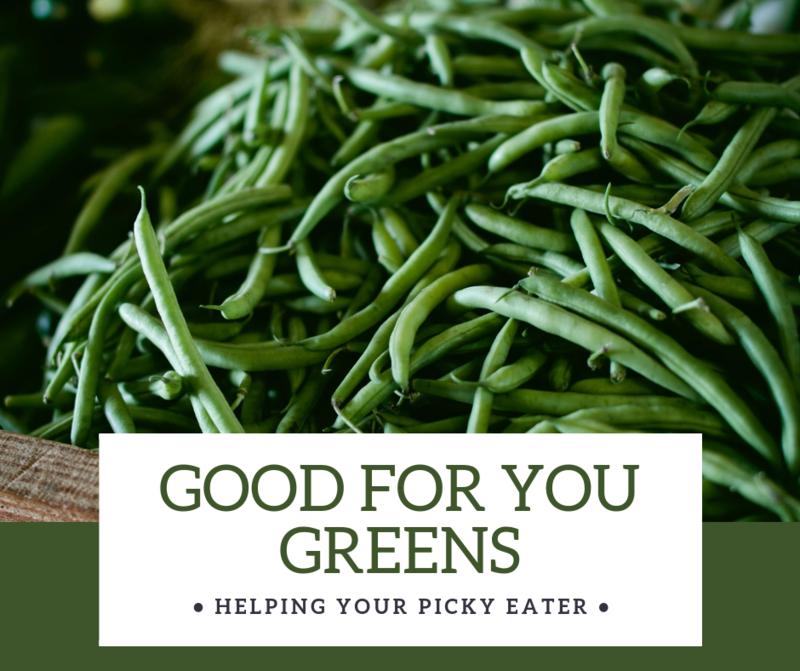 For most families, if one child is choosing a different diet/eating habits from the rest of the family that makes meals complicated and can add stress. Talking about how everyone in this family matters and there will need to be some compromise to make this work. There can’t be two separate meals each night for dinner and the vegetarian child can’t be eating “special” foods all the time that will make other siblings jealous. Coming up with recipes and meal ideas where the family can “build” their own dinner plate with meat and non-meat options can be one of the best ways to accommodate special requests. For example, if you are having hamburgers, then have meat burgers and veggie burgers available for the main entree. If you are having a grilled meat item, then make sure there is an acceptable non-meat option (grilled mushroom, tempeh or vegetables kabobs). Brain storm ways for the child to help take ownership over his/her meals (list making, shopping, cooking and cleaning up). Including your child in the meal planning and preparation process is a way to help them assuming responsibility for their meals. If your child is choosing to eat vegetarian then they can help come up with food items they would like include for meals/snacks that are healthy and don’t contain meat. They can also help prepare those items since they are part of the family. I believe that all children need to be involved with the food preparation and these skills help them grow up into independent people. Talking with your child about healthy eating habits is important. Working to accommodate their dietary preferences/choices is important as well. If you child has chosen to be vegetarian, there has to be some reason behind that change. Maybe is stems from a discussion they had with their peers and it leaves them really be grossed out or concerns about processed meat items. Maybe they are trying to restrict calories and that is presentation of vegetarianism is just a symptom of a deeper issue. As the parent, talking with your child is key to better understand what they are thinking and working with them to make healthy decisions. If you have questions about working with your child and dealing with food choices/dietary changes, let me know and I would love to be able to work with you and your child. As many of your know, I work in a NICU and work with Moms who are exclusively pumping or starting to breast feed their preterm baby. I know have a much better understanding how important and challenging it is to balance pumping and then working on breast feeding. It takes time and patience, because obviously you want your baby to latch on and be able to feed perfectly, but lots of time it takes a lot of effort on the part of the mother to help get baby in the right position and then monitoring your let down to make sure that baby doesn’t cough/choke. That was another challenge with Samuel was he struggled for several weeks to learn how to mange my let down. It was forceful and being able to watch for that, unlatch him and then re-latch him after the let down dwindled down. Some of you, if you are Registered Dietitians, are familiar or at least heard of FNCE. The Food and Nutrition Conference and Expo that happens annually around the country. This is the big national convention for Registered Dietitians hosted by the Academy of Nutrition and Dietetics. I have been able to attend FNCE twice, once as a dietetic intern in Boston, MA and then two years ago in Chicago, IL. It was a fantastic experience to be able to listen to speakers, see the amazing exhibit hall and then get to network with fellow RDs. Over the last 7 years of being a pediatric dietitian I have spoken with several other pediatric RDs about the lack of pediatric content at FNCE. There are obviously lots of topics that they are trying to cover and there are normally a few pediatric topics that are addressed, but not a ton. I wanted to make sure that pediatric nutrition continued to have a focus at FNCE and have some quality information to provide to other dieititians. Lots of RDs are being asked to cover NICU/pediatric units in hospitals and some times these RDs aren’t always the best equipped to know how to take cover of these complicated patients. I decided to put together a presentation proposal for FNCE with a friend of mine in Louisville, Laura Serke. 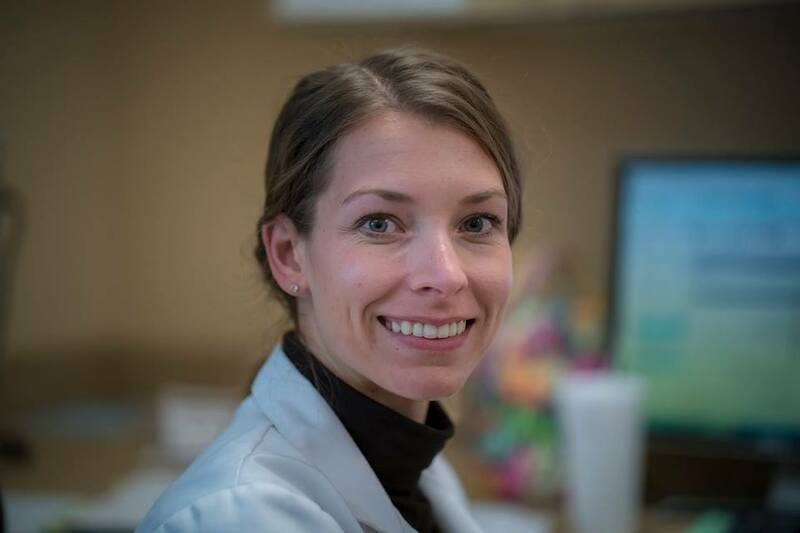 She is an amazing NICU RD in Louisville and also works as a lactation consultant. I thought it would be awesome to provide a presentation focused on how to handle human milk (or breast milk) in the hospital setting. This would centered around the NICU specifically, but we would also cover the pediatric side of it as well. RDs are often the ones that are asked to help provide guidance on how the transportation, storage and feeding of human milk is delivered to infant patients. Laura was in support of putting together this proposal and then with the help of Salisa Lewis as well (another amazing NICU RD with lots of experience) we finalized our proposal and submitted it back in November of 2018. 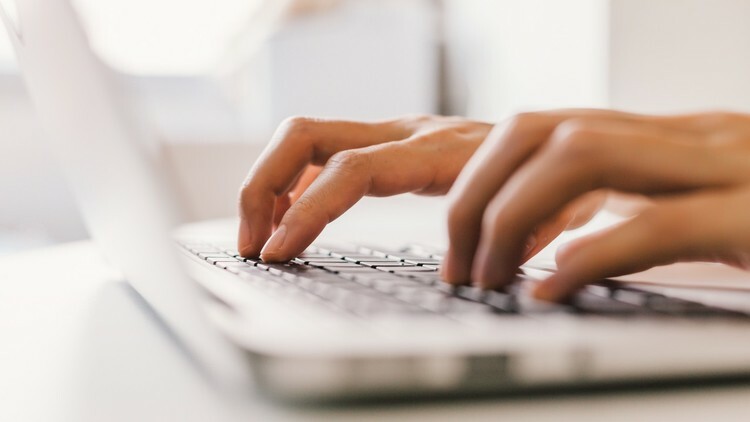 We worked hard over the course of a couple of weeks to create and finalize this proposal and articulate our thoughts in a way that sounded professional and interesting. It is tough to put together an interesting and interactive presentation on human milk in a way that would get a large group of people excited about the topic! I think we did a great job though coming up with a catchy title and putting all those ideas on to paper. Fast forward to this past week … we got word back that our proposal was accepted and we will be presenting our presentation at FNCE in Philadelphia, PA in October of 2019. If you are attending FNCE this fall make sure to mark your calendar for our session on October 27th at 10am! It will be a great presentation and worth getting up for! This is the best news that I could have gotten. I am wrapping up my maternity leave and kind of questioning leaving my baby to head back to work, but this was just the push I needed. I love what I do and love educating people about my job and supporting other RDs in that field of pediatric/NICU nutrition. It is tough being a mom, working full time, running a side business and at times I question if it is worth the stress to try to do all these things. Then moments like this where a crazy idea works out and becomes a reality and then I realize “yes” it is all worth it! So stay tuned to hear about about that presentation and of course pictures and documentation of the event in October of this year! It is hard to believe that we are now celebrating William's first birthday. It has been awhile since I have posted about William. I did several pregnancy posts throughout my pregnancy and then some breastfeeding and baby lead weaning posts over the last year. I wanted to take a moment and put together a fun post highlighting William's First Birthday. William was born on 12/23 and yes it is SUPER close to Christmas. We wanted him to have a separate birthday celebration and so we officially celebrated his birthday on 12/16. This party was mainly for use (William's parents), family and friends. William won't remember this party, but I know he will lose seeing the pictures when he is older. I wanted to do something fun and have this get together as a "thank you" for all the support from our amazing friends and family. Photo was from William's 12 month photo shoot we did with Karre Ann Photography in Noblesville, IN. So here are the party details. The theme - Dr Seuss! 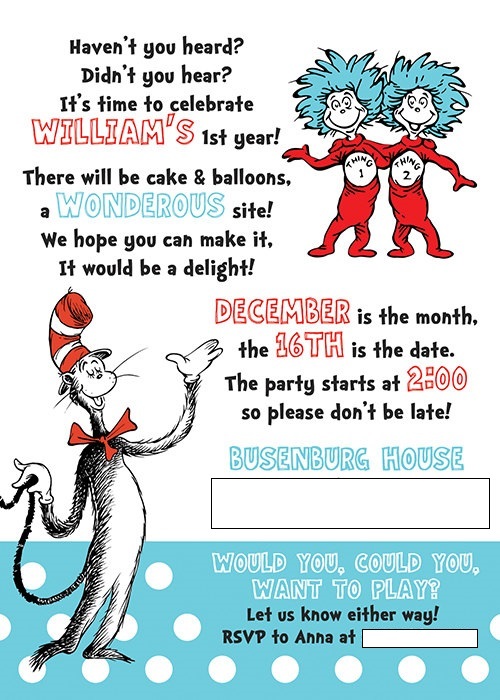 It kind of started with Cat in the Hat and expanded to include all Dr Seuss characters. We held the party at our house and there able to get some cupcakes made that we super cute. Shout out to Abby's Cakes for her amazing work. The menu included deviled eggs (green eggs/ham), cheese sticks (with the cat in the hat on them), relish tray, fruit salad, cheese ball. For the decorations we put up a wall decal of the Cat in the Hat that my Mom had used at a baby shower she hosted previously. It was great to have that to use again. 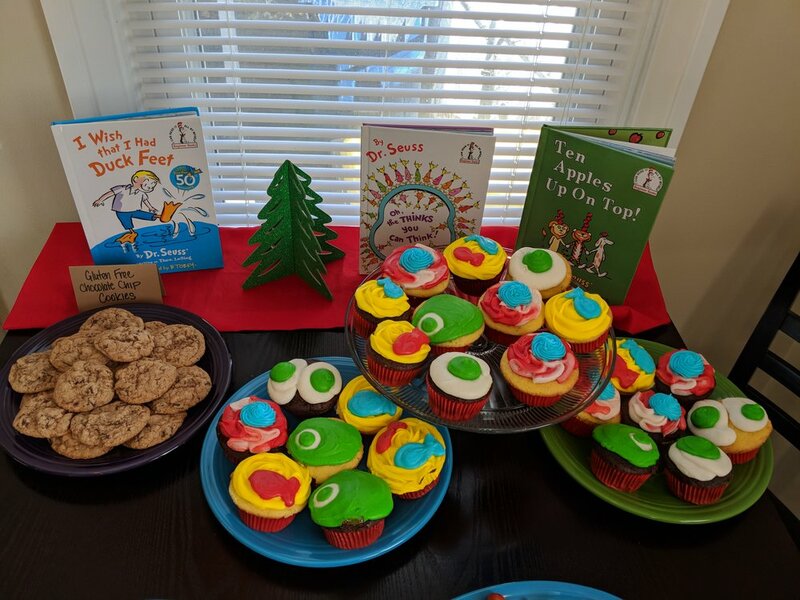 I also got Dr Seuss books that we used on the table as decoration. I painted the letters "ONE" for some other decorations. 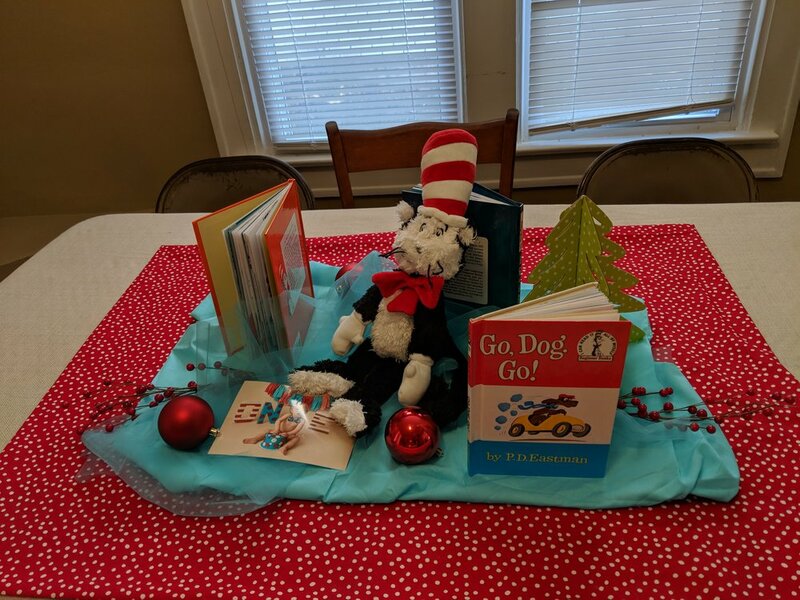 We got a little Cat in the Hat plush toy to serve as a decoration. I also made the Christmas tree Dr Seuss themed. I had the ornaments all red, white and blue and then made some fabric embroidery hoops with Dr Seuss fabric on the inside. I put together a few goody bags for the 3 kids that were able to come to party. I used blue bags with a hat on the front of them and filled them with some goodies (Dr Seuss pencils, stickers, playdough and snacks). It was an easy and fun way to send the kids home with some treats. It was such a great day to get together with family and friends and we have been so appreciative of everyone's love and support. It is so special to get to have William in our lives and get to celebrate him on this special first birthday. I wanted to do a quick write up about donating breastmilk to the Indiana Milk Bank. I was able to drop off some of my extra milk to the Milk Bank and I was very excited and wanted to share about that experience. I was able to go through the approval process to become a donor. Then I went ahead and donated 687oz of frozen breastmilk. My mother had this milk in her deep freezer and she helped me drop it off at Columbus Regional Hospital. I was so excited to be able to give some of my milk to the Milk Bank to sell to hospital to use for preterm babies. If you are a breastfeeding mother and have extra breastmilk, you should consider becoming a breastmilk donor. Check out my first post about this - CLICK HERE. I also donated some breastmilk to a random stranger on Facebook .... gasp! I know right? I was torn about it. But here is why I did it ... I had some breastmilk that had been in a refrigerator/freezer for > 6months and I wasn't able to donate it to the Milk Bank. There standards can < 6months in a refrigerator/freezer. This was milk that I didn't need and I wanted it to go to someone that could use it. There was a lady on a Swap Group I belong to on Facebook who was needing donor breastmilk for her little one and she hadn't been able to find anyone with extra milk. I really felt like I could and should help her. I felt like I wanted her to get good, safe milk and I let her know that I was an approved donor through the Milk Bank. I was able to give her over 200 oz of breastmilk. Normally I am not a fan of just giving away your breastmilk to a stranger, but I felt like if you think about it and do what you feel comfortable with that can be the write call. I also wanted to touch on breast pumps. I have had several people ask me about my breast pump. I went ahead and purchased a Medela Symphony. This pump is a hospital grade pump and it is what you would use while in the hospital or if your baby was in the NICU. This is a great pump, but is very expensive to purchase on your own. Insurance won't purchase it for you. I was very torn about what type of pump to purchase. I really liked Medela, but there are so many different options and I kept hearing such mixed messages about all of them. I was really stressing about it and that is when my husband suggested we look online for a used Symphony. We found one on Ebay that was ~$600 and it has ~75 hours on the machine. This was a great deal when retail value is ~$1000. I knew that this pump would work well and I wouldn't stress about it. If I had rented the same pump through the hospital it is $60 a month and over the course of 12 months that costs $720. So I knew that I would get my money worth out of that pump if I purchased it on my own. I just wanted to share that story with you, because I don't think people realize that you can purchase a used Symphony pump. Now, please be smart about it when you shop on Ebay. But if you really want that hospital grade pump there are ways to obtain one for less than the retail price of $1000. If you are looking at getting a breastmilk pump through your insurance .... do your research, look online and talk to your friends. Try to figure out what pumps have good reviews and evaluate what would work for you. This is a big decision and you need to make sure that you are making the best choice for you and your little one. Food allergies are on the rise amongst children. This is a common issue that lots of families struggle with. Peanut allergies are one of the most common food allergies out there. In fact, in the US the incidence of food allergies has increased 400% from 2007 until 2016. The incidence of peanut allergies has increased 450% in that 9 year span. This is an alarming increase in the percentages of food allergies and specifically peanut allergies. Researchers have been looking at ways to combat this alarming trend. For lots of children they tend to out grow their food allergies, but for some it is an issue they struggle with their entire life. There was a research study that was done in the UK in 600 infants looking at the exposure to peanut protein powder and their incidence of peanut allergies by 5 years of age. These infants were labeled as "high risk" because they has eczema and issues with eggs. The cohort was between the ages of 4-11 months when they were started in this study and they were followed through 5 years of age. This group of 600 infants were divided into two groups: 1) avoid peanut protein completely and 2) were given 6g peanut protein powder weekly. The research findings showed that there was a reduction in the incidence of peanut allergies by 81% in the group that was exposed to peanut protein. Out of that group only 1.9% ended up with a peanut allergy compared with 13.7% of the children in the complete avoidance group. This is very interesting research because it definitely leads us towards the idea that early exposure could potentially help to decrease the incidence of peanut allergies. Currently the AAP says that you can give peanut/peanut products to children when you start solid foods if there is no family history of peanut allergies. If there is a family history of food allergies then have a discussion with your pediatrician first. With careful monitoring from a pediatrician and a dermatologist, you can still give your child some peanut protein and that small dose, over time could help reduce the incidence of an allergy in the future. There is a product on the market called Hello Peanut. This product is very interesting because it could help serve as a tool for health professional to exposure children to a small amount of peanut protein and with close monitoring could help prevent peanut allergies. The way the product works is you start with the introduction packets and use it for 7 days. Each day you give one packet of the peanut protein and each day the amount of peanut protein in the packet increases in volume. It is kind of like a peanut challenge. If your child is able to tolerate the increasing dose over that week then you can move up to the maintenance packets. One issue with the research study that I mentioned above, is that there is no set length of time that is associated with how long you need to continue this exposure to peanut protein to prevent an allergic response. They are doing a follow up study to look at having those 5 year old, not consume peanuts for a year and see if they are exposed to peanuts after that year, if they elicit an allergic response. This is all a neat idea to potentially decrease people's risk of developing a food allergy by giving them some exposure to this protein and letting their bodies adapt to that protein and not elicit an allergic response. There was a great write up in the New York Times about the Hello Peanut product and how it can be used. Again, this is best used under the supervision of a health professional to ensure the safety of the child taking this product. If you child already has a diagnosed peanut allergy this is not a fix for that condition. There is no cure of peanut allergies. The other really interesting thing about this research study is it prompted the FDA to look at this research and put forth a "Qualified health claim" that says that consuming foods with peanuts could potentially help prevent future allergies. This is the first time that the FDA has made a statement like this in regards to a food allergy. The whole claim is as follows "for most infants with severe eczema and/or egg allergy who are already eating solid foods, introducing foods containing ground peanuts between 4-10 months of age and continuing consumption may reduce the risk of developing peanut allergy by 5 years of age." Now there needs to be further research in this area and the FDA does knowledge that, but this is a huge step forward for food allergy research and could have a big impact on those of children and their lives in the future. If you missed the FOX59 segment talking about this research study that aired in Indianapolis, click this link! I wanted to do another follow up post about Baby Lead Weaning. Besides encouraging your child to use their hands and feed themselves, finding utensils/sippy cups that work for your child can be overwhelming. There are lots of products out there, but I wanted to take the time and highlight a few items for you. 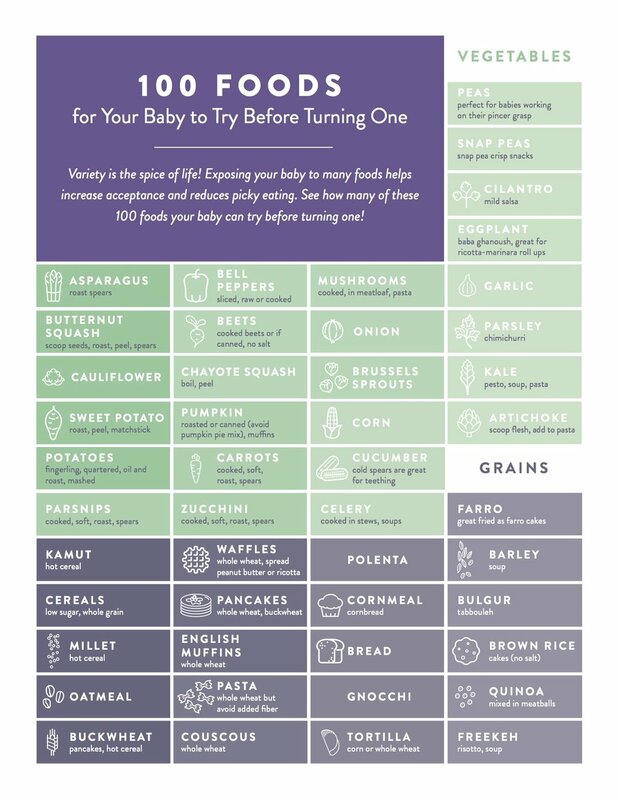 I have heard about these items from Katie Ferraro who is an amazing dietitian who has some great education on baby lead weaning. What to use? This has been one of my biggest struggles since starting solids with William. Breast feeding is easy because you don't have to use anything special. But with starting solids it is a whole new ball game. These are a great product that I discovered through Katie Ferraro. I ordered a set for William and I think they are great. William loves holding them and putting them in his mouth. I can't say he has mastered the art of using utensils, but he has a ton of fun playing with them. These utensils are ergonomically designed to fit little ones hands. It allows for a natural vertical grasp and has a choke protection barrier to allow for safe self feeding. These also work great for baby led weaning. They can easily be cleaned in the dishwasher and are BPA free. I have to confess I have used this only a few times, but I love the concept for this utensil. This all in one placement and plate works well to contain food. It also sticks to the table and it is hard to pick up and toss to the floor. The compartments can hold two 4oz portions and then one 10oz portion. That would work for a fruit/veggie, protein and carbohydrate. This is easy for a small child to use and work on developing their fine motor skills. You can wash it in the dishwasher, use in the microwave and it is oven safe up to 350 degrees. I had two packages of these given to me from a friend and William loves them. I love this because it is durable to use again and again, but if it is lost it is not the end of the world. The colors are fun and they travel cap works great. They also don't have a valve, which I really liked. I want William to be able to gain the skills to control the flow of the milk out of the sippy cup and this will allow him to practice that skill. These are dishwasher safe as well and BPA free. What products have you used that you like? Are there any brands or types of baby feedings products you really liked? There are so many types of feeding utensils out there it can be overwhelming. If you are on the hunt for some great products to try, make sure you check these out! If you missed my first blog post about Baby Lead Weaning - CLICK HERE to learn more about how this is a great way to teach your child to love food! In case you didn't know, August is National Breast Feeding Month. Many of you probably already know that I am breast feeding my first child. We have been going strong for the last 7 1/2 months. It is a big commitment. 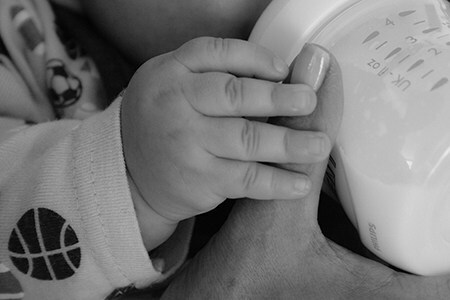 I haven't really talked about breast feeding here on the blog since William was first born. That first post was entitled The Gift of Breast Feeding. I think that is such a good way to look at breast feeding. It is A LOT of hard work and it is truly a gift that you are giving to your child. I made that choice for William and I try not to complaining about breast feeding/pumping, but instead look at it as a wonderful opportunity that I GET to do and I am giving to him. I have been volunteering with the Breast Feeding Support Group at St Vincent Women's Hospital for the last several weeks. I am working towards getting experience and hours for my IBCLC certification. This credential stands for an International Board Certified Lactation Consultant. This credential is a great way to get continued education about maternal and infant health/development and how to help mothers trouble shoot breast feeding. I have really enjoyed being able to work with some Moms on Fridays in an outpatient setting. It is so neat to see these mothers band together, lift one another up and support each other in this journey of motherhood and breast feeding. I was talking with one mom who said that the support of the lactation consultants and this group has helped her so much that without that support she wasn't sure she would still be breast feeding. That is a huge testament to supporting and educating mothers on how to trust their bodies to provide milk for their babies. I think lots of times we have the false idea that we, as the mothers, are in control of the feedings for the baby. In all actuality, the baby determines how much they want to eat and how they are going to do it. Trusting your baby and body is a tough thing to learn. Getting to work with some of these moms and encourage them has definitely been the highlight of my Fridays. Feeding your baby formula can cost you ~$1,500 a year or an average of $30 a week. Because breast fed babies are less sick, you will miss fewer days at work to stay home and take care of your baby. Breast feedings helps keep your baby healthy. Your child is less likely to get sick when they are breast fed. Your breast milk can help prevent ear infections, diarrhea, respiratory illnesses, childhood obesity and childhood leukemia. Breast milk and breast feeding your baby helps to decrease the risk of SIDS by > 70%. Breast feeding if good for your health (as the mother), because your risk of breast cancer and ovarian cancer also decreases. Mothers who have a plan from the time before their child is born are more likely to stick with it. Breast feeding is tough and can be challenging, but those mothers who are determined are more likely to stick with it. Getting your support system on board with your plans to breast feed will help you be successful as well. Breast milk nature's perfect food. Your breast milk is designed for your baby. It is easier for your baby to digest than formula and you pass along your immune fighting agents to your child. You are the mother, have the power to give this unique and perfectly designed food to your baby. It has been a little while since I have share with you about my little one, William. You got to hear all about my pregnancy and how things were going. I wanted to move onto another fun topic that I enjoy ... pediatric nutrition. This is totally my jam. Now my main focus is neonatal nutrition and obviously my child is out of that stage. He is now 6 months old! He is moving and grooving. He started crawling just around 6 months old. He is now obsessed with pulling up on things. When he pulls up and stands on his feet he is SO proud! He is just jumping through ALL of these milestone hoops. Over the last couple of weeks we have also started solid foods. I am doing Baby Lead Weaning with William. I am not sure if you have heard of this approach, but I think it is one of the best ways to teach your child how to love food. The premise is that you use table foods (foods that you would normally eat) and use those to teach your child how to eat. There is no jar baby food involved. Those products are over priced and totally void of much nutritional value. If you want to feed your child is a healthier and most cost effective way ... then keep reading, because this method is for you. Baby lead weaning simply means letting your baby feed themselves from the start of solid foods. There is no force feeding baby food mush. The term was coined by Gill Rapley who was a midwife. Check out her book HERE. Around 6 months or when your baby is able to sit up and is showing interest in foods if when you can start offering table foods. You simply hand your child a suitable size piece of food and they can play with it, smell it, lick it, mash it up, get it all over them and get the full experience of eating. At the beginning a very small portion of the food actually gets to their mouth/into their bellies, but they are learning all about food during this time. There are no purees, no ice cube trays, no food processing, no mashing of foods, no baby cereal or strange jar food combinations. Instead it is your baby eating food that that you eat at your dinner table. Encourages and teaches family meal time. Everyone comes together at the table and eats together. The baby gets to participate in meal time by being at the time and eating appropriate finger foods that the rest of the family is eating. The child gets to choose what, how much and how quickly they want to eat. This method gives the chance to explore various new textures and tastes. There is no pressure to have to eat something. Continue to nurse or give a bottle just as often as you normally would. Solid foods at this point are made to go with the milk. The baby will regulate and start to eat more solids and decrease milk intake on their one. Usually this will occur later in the first year. For a baby at 6 months old, the main source of their nutrition is either breastmilk or formula. When you think about it baby lead weaning ends up being a continuation of breast feeding. When a baby goes to breast, that baby is determining how food milk he is drinking. When he is satisfied he is done. The breastmilk will take on different flavors, depending on the mother diet and this is an early introduction of what food tastes like and will increase baby's acceptance of those foods later in life. These concepts are continued with baby lead weaning, because the baby is deciding if they want to try foods and how much of foods they want to try to eat. This method encourages that self regulation and exposures to various foods. If you have questions about baby lead weaning or want more information, send me a message. I have various resources that I would love to share with you. I believe that is it so important to build a healthy relationship with food and that starts when your baby first starts solid foods.